In the winter of 2009-2010 a young executive, Bill is promoted and transferred to London for a major International firm. He has struggled for the better part of his life with nightmares and phobias, which only seem to worsen in London. As he seeks the help of a therapist he accepts that his issues may well be related to a 'past-life trauma'. Where Does Nostalgia End & Being Stuck in The Past Begin? This very thought has been dancing through my mind in the last few weeks. At what point does Nostalgia become so much that we get too stuck in the past and forget to live for today and create a great tomorrow? It all began with two movies and one death. The movies are Dark Shadows which to me so vividly portrayed 1972, and MIB3, which transported me to 1969. Especially the latter as it transported me back to such a specific date that I could remember very clearly. The death was that of Donna Summer and her music; songs to which I enjoyed dancing, drinking, laughing. This created a great momentum where friends shared photographs and stories, the whole where were you when moments. Social Media in the last year has opened so many doors to my past; really feels like pasts. I have lived in various countries and experienced different things that involved very different groups of people, and suddenly all of this is merged in facebook and it feels very strange, especially when people get nostalgic and re-live this or that moment and the moments become so intertwined with the present. I am an individual who has always compartmentalized and let go, moved forward as it were and suddenly here I am remembering being Nostalgic. The biggest problem with nostalgia is that in as much as it brings the memories of Joy, it also brings up memories of pain and sadness. Please do not get me wrong – I had an amazing youth and I lived it to the fullest! Like anyone, I suffered from my share of broken hearts and the guilt of those I broke; as well as my share of disappointments in unachieved plans and unfulfilled expectations. Pondering on Nostalgia creates the danger of the what ifs; a dangerous place to visit, taking on the responsibility of how much greater one could have been if only a different choice had been made here or there. Yesterday belongs in the past and in order to lead a full life there is no question but that we must look forward to the future. Enjoying the wisdom of anything and everything learned in the past as great tools to make the right turns and the right choices but never second guessing what we may have been and forgetting to become amazing while enjoying the person we are today. I especially wonder about future generations who with today’s technology document so many moments, their past will always be there in a little card or thumb drive; will it make them more nostalgic or more realistic and ever living in the present? M.C.V. 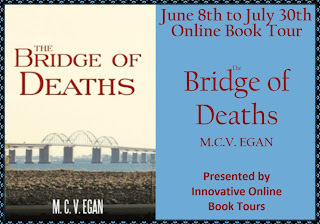 Egan is the pen name chosen by Maria Catalina Egan the author of The Bridge of Deaths. 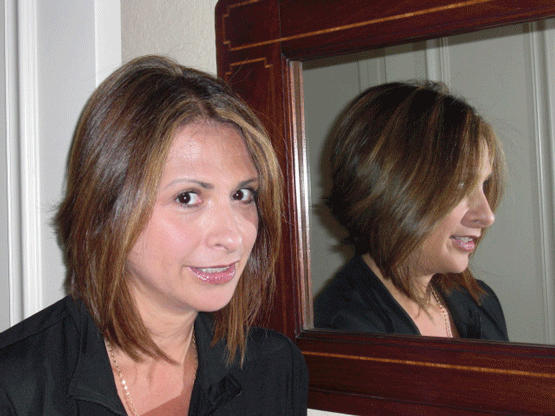 Catalina was born in Mexico City, Mexico in 1959, one of eight children. From a very young age she became obsessed with the story of her maternal Grandfather, Cesar Agustin Castillo, mostly the story of how he died. She only spent her childhood in Mexico. Her father became an employee of The World Bank in Washington D.C.
From the early 1970s at the age of 12 she moved with her entire family to the United States. She was already fluent in Southern English as she had spent one school year in the town of Pineville, Louisiana with her grandparents. There she won the English award; ironically being the only one who had English as a second language in her class. In the D.C. suburbs she attended various private Catholic schools and graduated from Winston Churchill HS in Potomac, Maryland in 1977. She attended Montgomery Community College, where she changed majors every semester. She also studied in Lyons, France at the Catholic University for two years. In 1981, due to an impulsive young marriage to a Viking ( The Swedish kind, not the football player kind) Catalina moved to Sweden where she resided for five years and taught at a language school for Swedish, Danish, and Finnish businesspeople. She returned to the USA where she has been living ever since. She is fluent in Spanish, English, French and Swedish. Mrs. Egan has worked for various companies and holds an Insurance license for the State of Florida. Not her favorite field but involves very nice folks and makes money! Maria Catalina Egan is married and has one son, who together with their five pound Chihuahua makes her feel like a fulltime mother. Although she would not call herself an Astrologer she has taken many classes and taught a few beginner classes in Astrology. This is one of her many past times when she is not writing or researching. 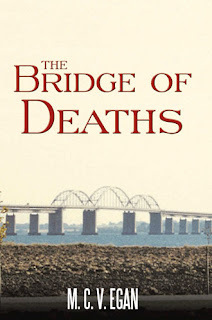 She celebrated her 52nd birthday on July 2nd 2011 and gave herself self-publishing The Bridge of Deaths as a gift; she never submitted it to anyone prior to this decision and has enjoyed the very positive feedback. You can keep up with M.C.V. Egan on her Website and Facebook. Thanks for inviting me and being part of my virtual book tour. Great Blog! You bring up a really intriguing point; in the past we had our memories which may have been colored or distorted by our own feelings and the passing of time. Today's generation see everything exactly the way it was, so there are no shades of remembrance, only well documented snippets; youtube videos, blogs, movies, wikipedia, etc. It used to be, when listening to a song on the radio, or having a discussion about some factoid in history, that you'd participate in a long and spirited discussion of the event. Now everyone just pulls out their smart phones and comes up with an immediate answer. I miss those animated arguments that we all used to have. Immediacy isn't all it's cracked up to be. Yes, I believe they are limited by the reality versus what you so aptly put as shades of remebrance. Last comment by Thomasina Burke, not sure why it said unknown! 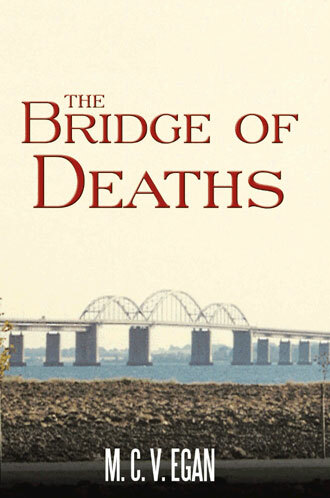 Catalina is an amazing author, and her book "Bridge of Deaths" is an intriguing mixture of past life regression, history, and love. Enjoyed her book immensely! Thanks Thomasina, I too enjoyed Magic Bridge! So sweet of you to drop by! It's funny how many little things you get used to - attached to, even - and never realize until you travel abroad and those things are not available.